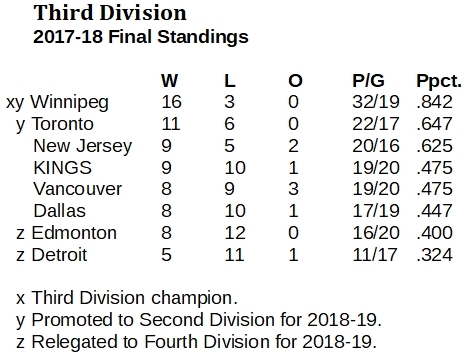 The Ducks won seven of eight through the heart of the First Division season in 2017-18, claiming the top tier title. 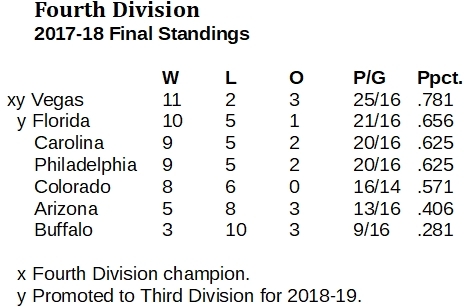 The Boston Bruins and Minnesota North Stars earned promotion to the top for 2018-19. The Ducks tacked together seven wins in eight First Division games over a period of nearly three months and stormed to the championship among this top flight of professional hockey clubs. The Ducks began their title run with a 5-4 overtime win on the road against the New York Islanders on Dec. 21 and won three straight before falling on Feb. 3, 5-2, in a road game against the Montreal Canadiens. Then, the Ducks won another four straight before a 4-2 loss on the road against the St. Louis Blue on March 12. With that run of games, the Ducks pretty easily claimed the championship with a .719 winning percentage, ahead of the Washington Capitals (.667) and the Pittsburgh Penguins (.643). During their hot run, the Ducks beat Washington once and Pittsburgh twice. Montreal couldn't stave off relegation despite being the only team to beat the Ducks for nearly three months. After beating the Islanders two straight through March 2, the Canadiens were 6-5 with two overtime losses, well off contention, though apparently safe from the wolves. However, the wolves were at their door. The Canadiens lost their next five First Division games to end the season. If they had captured just three points from those games, they would have been spared relegation. Or, they could have beaten the Columbus Blue Jackets in a road game on March 12. But the Jackets took it, 5-2, and were thus spared relegation. 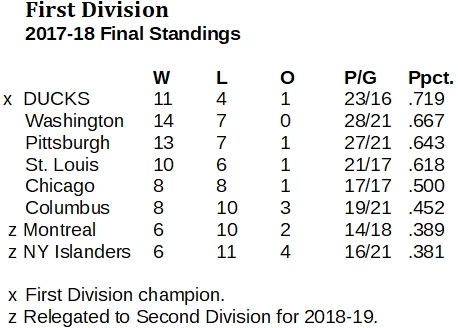 Joining the Canadiens in the Second Division for 2018-19 are the Islanders, who finished even below Montreal in a lackluster campaign against the elite level. The Boston Bruins and Minnesota Wild made there be no doubt about how the Second Division was going to go in 2017-18. They were going to be the top teams, decisively. The Bruins won the championship nod with 15 wins in their 19 games for an .816 points percentage, but the Wild were right there with them with 13 wins in their 19 games and, nearly as important, the same number of losses (three). So, the Wild was second at .763. Likewise, the Bruins and Wild dominated the Third Division a year earlier. In that case, too, the Bruins finished on top and Minnesota came in second, but both were promoted. No other serious contenders emerged. A group including the Nashville Predators, Tampa Bay Lightning, San Jose Sharks and New York Rangers were middling performers in this division. 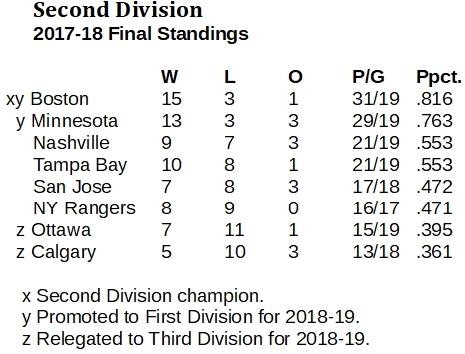 The bottom two teams, both ticketed for the Third Division in 2018-19, were the Ottawa Senators and Calgary Flames. The Winnipeg Jets enjoyed the most dominant year of any hockey team in any division in 2017-18, blasting through the Third Division with 16 wins in 19 games and a points percentage of .842, the highest of any team in pro hockey. 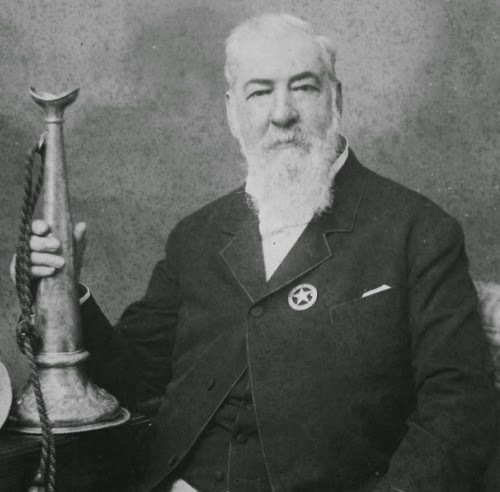 The Toronto Maple Leafs won promotion with second place and a .647 showing. The New Jersey Devils won their last three games, including a 2-1 decision at home against the Leafs on April 5, but still came up short of promotion. The Edmonton Oilers and Detroit Red Wings finished easily in the bottom of this batch, earning Fourth Division relegation for 2018-19. A new team entered the highest level of professional hockey in 2017-18. Well, in this world, not quite. The Vegas Golden Knights were assigned to the Fourth Division as a new franchise. But the Knights won't be back there in 2018-19. They easily won the bottom division with 11 wins in 16 games and a .781 points percentage to earn a Third Division promotion. The Florida Panthers were going nowhere fast in this bottom group, floundering to a 1-5-1 start. But the Panthers won their last nine games in the Fourth Division and captured second place, earning a Third Division promotion. The Carolina Hurricanes, Philadelphia Flyers and Colorado Avalanche were left barely in Florida's wake.